Nikki Bush is the co-author of two of the best parenting books: Future-proof Your Child, published by Penguin in 2008, and Easy Answers to Awkward Questions, published in June 2009 by Metz Press. Her third book, Tech-Savvy Parenting, co-authored with Arthur Goldstuck, was published by Bookstorm at the end of July 2014 to much acclaim. Nikki collaborates with other experts to make sense of 21st century parenting and education challenges. She is well-known for her insight and common-sense approach, providing practical and creative ideas, guidance and solutions to parents, educators and leaders. Future-proof Your Child, co-authored with best selling author and futurist, Dr Graeme Codrington, is a South African bestseller now in its 6th reprint. It highlights the critical importance of making choices, having conversations, and consciously connecting with tomorrow’s children today. This book will assist you to create a framework for your parenting experience as you embark on the highly personal adventure of raising children who will thrive in the future. Nikki’s sexuality education book, Easy Answers to Awkward Questions, co-authored with educational psychologist Ilze van der Merwe, was written for children between the ages of 8 and 13 in an easy question and answer format, with delightful illustrations to add a fun element. It will double as an invaluable guide for parents so that they can answer their children’s questions candidly, with knowledge, sensitivity and humour. This best-seller is now in its 3rd reprint and is also available in Australia. 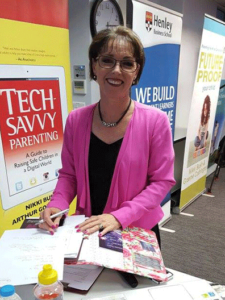 Tech-Savvy Parenting, brings together the experience, research, observations and advice of respected parenting expert Nikki Bush, and leading technology commentator Arthur Goldstuck. This insightful duo will help you get a handle on what’s happening in the digital space to ensure your children are safe and savvy in this fast-changing world. They’ll guide you through the terminology, dangers and opportunities of technology, while placing children’s use of all things digital firmly in the context of the relationship between parents and their children. Nikki writes a monthly column called Parenting Matters© which is used in both school and corporate newsletters/intranets in South Africa and abroad. To subscribe to Parenting Matters kindly complete below and submit. This short, punchy and enlightening parenting e-book is free. Download it here now. …plus 14 other important topics. You can dip in wherever you like as they can be read in any order. Prepare yourself and your family for going back-to-school. The e-book is ideal for pre- and primary school parents to help you with every new beginning, whether it’s a new school year or a new term. 10 of my favourite family recipes. TECH-SAVVY PARENTING brings together the experience, research, observations and advice of respected parenting expert Nikki Bush, and leading technology commentator Arthur Goldstuck. This insightful duo will help you get a handle on what’s happening in the digital space to ensure your children are safe and savvy in this fast-changing world. They’ll guide you through the terminology, dangers and opportunities of technology, while placing children’s use of all things digital firmly in the context of the relationship between parents and their children. Talent Re: Defined is a framework that looks at six areas where high-performing talent functions in new, more effective ways, and ultimately, how they distinguish themselves and stand out from the crowd. Each point has a simple self-test to raise personal awareness and application of the framework.